I was out of town a few days last week. It was nice to get away from the cold weather for awhile. Several lessons were waiting for me when I got home. After I have reviewed a lesson, I send an email with my letter and the next lesson attached. The swatches generally go in the mail the next day. I have been known to forget to attach the letter or the wrong lesson. Please let me know as soon as possible and I will get the right information to you. If I am not at home (and have just my iPad) I may not be able to check this immediately but I will fix it. I apologize to anyone who has had to wait! The next few articles in the Finishing With Confidence series in Cast On. The first was about yarnover buttonholes. Buttonholes are also part of Level 2 of the Masters Program. Eyelet buttonholes are probably the most common type of buttonhole as they are easy to make and to place. The disadvantages of this type of buttonhole is that it is fairly small and not that strong. With that said, I still use them quite a bit. Some sources say to work to two stitches before the location for the buttonhole, then K2tog, yo. I rarely do this as I prefer to work the yarnover first, then the K2tog. I find it easier. I can see exactly where the buttonhole will be. The other reason is that I prefer how it looks. When you work a K2tog decrease, the stitch to the left is on top of the stitch to the right which makes it slant to the right. This falls into the "Number of Angels That Can Fit On A Head of A Pin" type of discussion but I prefer to have the stitch on the side of the buttonhole to be on top, that than the buttonhole stitch. A feature (or flaw, depending on how you look at it) is that yarnover buttonholes can be almost invisible in some stitch patterns. There are two buttonholes in the photograph below. I might have to stretch it a bit to find the buttonholes. In the photograph below I have pulled the garter stitch fabric so that the buttonhole is more visible. Quite a few years ago, a knitting group here did a knit along of Sally Melville's Einstein Coat which is all garter stitch and several of them could not find their buttonholes when they had finished the coat. As I mentioned before, working eyelet buttonholes in K1P1 ribbing can require some thought. If you want to use K2tog decreases, make your yarnover first. If you want to work the decrease first and then the yarnover, use SSK decreases. 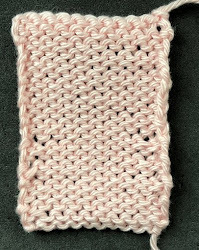 In the photograph below I have stretched the swatch so that you can see I have used two different types of decreases. (This is the same swatch as in the photograph above, by the way.) You can see that the final results are pretty much the same. Salon will be on Sunday from 1-3 pm. If I am not working to a deadline I can take forever to do the simplest thing. The two projects I have been working done the past two weeks demonstrate this. I was knitting a pair of socks for Stephanie's birthday and when I went to block them, I realized that the second socks was about 1/4" wider than the first sock. At first I thought that I had used a different needle size but then I realized I had made the second sock with a different number of stitches. I went on autopilot. Since the socks didn't require a specific multiple I didn't notice. Luckily Jane at Magpie yarn had another skein of the same yarn so I knit a third sock. I decided to make a mate for the first sock so now I have knit four. Since I have so much yarn left, I am making a pair of anklets for another friend. Everyone gets pink socks this year! My next project was a pair of socks for the person who lent me the nautical map we used for our photo shoot two weeks ago. Here is George guarding Version 1. Version 1 was knit on 2.25mm needles with a total of 72 stitches. I was about 3 inches above the heel when I decided I didn't like it. So I started Version 2 which was knit on 2.5 mm needles on 64 stitches. I was at about the same place when I decided I didn't like the cable spacing so I started over again. Here is Version 3 which I do like. 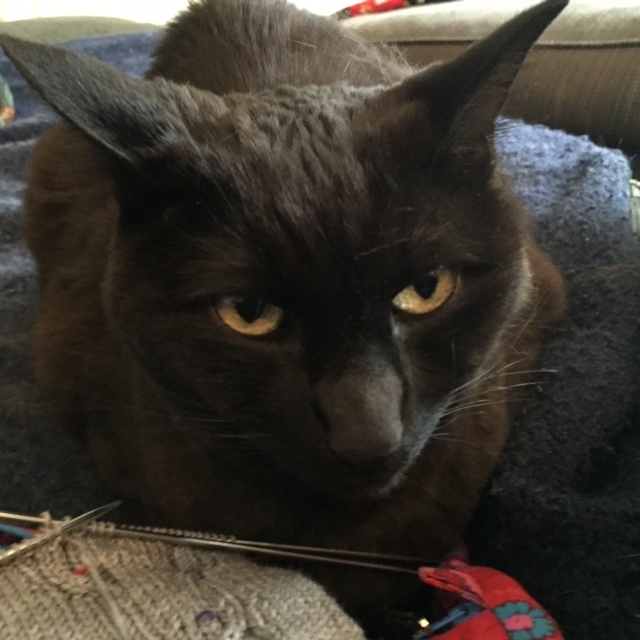 I never pull these stunts when I am knitting to a deadline. I do like the pattern on these. I want to do another project where the cables shift, maybe a vest. George does not look very happy!